Indonesia has set aside a total of 52 national parks since 1980, with its largest being Teluk Cenderawasih in West Papua. A wild Komodo Dragon in Komodo National Park. Indonesia has established a total of 52 national parks since 1980, with its largest being Teluk Cenderawasih in West Papua. Teluk Cenderawasih is famous for the Orangutan Conservancy that protects its residentendangered orangutan primates. Parks such as the Komodo National Park protect the world's largest lizard, the venomous Komodo Dragon. Some of the National Parks in Indonesia have achieved United Nations Educational, Scientific, and Cultural Organization (UNESCO) recognition as Biosphere Reserves for providing habitats and protecting many plant and animal species. These parks include the Lore Lindu National Park and Tanjung Putting. The Friends of the National Parks Foundation is an Indonesian-based nongovernmental organization (NGO) that helps conserve the national parks in the country through reforestation and other efforts. The largest national park in Indonesia is Teluk Cenderawasih with an area of 5,611 square miles. It consists of the islands of Roon, Yoop, Rumberpon, Mioswaar, and Nuswori. The national park has mangrove ecosystems, coral reefs, tropical rainforests, and marine water. The dominant plant species are Bruguiera and Avicenna species, Casuarina equisetifolia, Terminalia catappa, Metroxylon sagu, and Nypa fruticans. More than 200 fish species like the damselfish, rabbitfish, butterflyfish, and sharks live in the park. Other fauna includes mollusks such as the cowry, Lambis species, Strombidae, and giant clams, turtles like the green turtle, hawksbill turtle, and leatherback turtle, as well as mammals including the blue whale, dolphins, and dugong. The park is home to the Orangutan Conservation which has tow extant great apes of Asian origin. The Orangutan monkeys are native to Indonesia and Malaysia. Like other parks in Indonesia, the park faces threats from illegal logging, unlicensed mining, and deforestation. Friends of the National Parks Foundation, an Indonesian NGO, have made slow but progressive measures to conserve the park. The Komodo National Park in Indonesia has an area of 701 square miles. The park extends from the islands of Komodo, Rinca, and Padre and other 26 smaller islands. It has a rugged terrain characterized by round hills rising to 735 meters above sea level. The national park has a hot and dry climate with annual rain falling ranging from 800 millimeters and 1,000 millimeters. 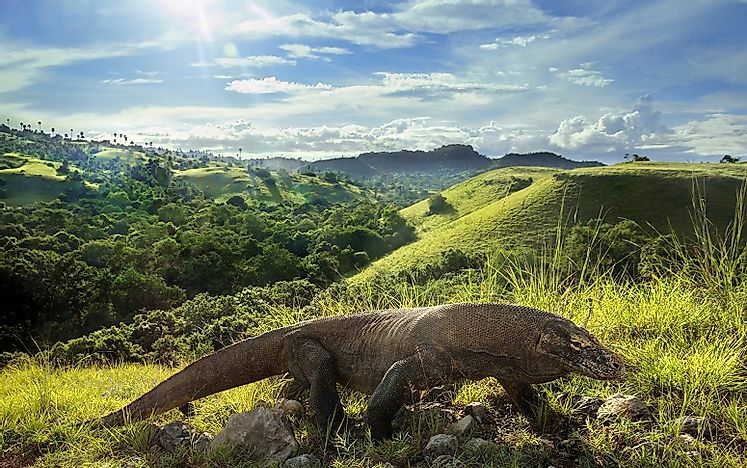 The savanna vegetation provides a habitat to the world largest lizard called Komodo dragon (Varanus komodoensis) which is also venomous and an endemic species to Indonesia. Mangrove forests make up the coastal vegetation. Fringing and coral reefs grow extensively along the Northeastern coast of Komodo. Major fauna includes whale sharks, pygmy seahorse, eagle rays, ocean sunfish, blue-ringed octopus, and sponges. The terrestrial fauna is less developed compared to the marine. Land mammals include the Timor deer, water buffalo, wild boar, and crab-eating macaques. There are also Australian birds like Orange-footed Scrubfowl and the helmeted friar bird. Other reptilian and snake inhabit the park. The most significant conservation strategies include strict enforcement against poaching and illegal fishing by coordinated patrols from the locals, police, and the Indonesian Navy. Lore Lindu National Park in Sulawesi, Indonesia occupies an area of 884 square miles. The park covers lowland and montane forests varying from 200 to 2,610 meters above sea level. The terrain consists of valleys to the north, east, and south and the Kulawi valleys lie to the west. The park has a tropical climate with high humidity. In the lowlands temperatures vary from 26°C to 32°C and for every 1,100 meters elevations temperatures drop by 6°C. Lore Lindu National Park provides a home to many plant and animal species. Endemic mammals include the Tonkean macaque, Anoa, pygmy tarsier, Celebes rat, and Sulawesi dwarf cuscus. Endemic birds include the purple-bearded bee-eater, maleo, and geomalia. There are also many reptiles and amphibians like the gold snake and Sulawesian toad. Illegal logging and land encroachment are the critical threats facing the park. Even though the park was declared a UNESCO Biosphere Reserve in 1978, lack of law enforcement, and minimal awareness of forests' importance challenge the country. Tanjung Putting National Park in Indonesia has an area of 1,370 square miles. It is located in the Southeastern region of West Kotawaringin Regency in Central Kalimantan. The park consists of mangroves, dry-land dipterocarp forests, heath areas, peat swamp forests, and a coastal beach forest. The Kumai River flows on the northern side of the park. Even though the forest is protected, about 65% of its primary forests have degraded. Beyond the Kumai River, most of the forests have been cleared to for palm plantation. The park was founded for the protection of proboscis and orangutans. In 1977 UNESCO declared it a Biosphere Reserve. Other animals living in Tanjung Putting National Park are clouded leopards, Gibbons, Macaques, samba deer, sun bears, wild boars, and porcupines. Reptiles in the park include crocodiles, pythons, and monitor lizards. Birds such as hornbills and kingfishers, insect species like the giant Bornean butterfly also live in the park. Illegal logging, deforestation, and illegal mining continue to threaten the integrity of this park. Habitat loss as a result of the named threats is the most significant problem likely to face the wildlife of Tanjung Putting Park if the threats are not neutralized. An Indonesian NGO, Friends of the National Park Foundation, has come forward with conservation efforts and even though the progress is slow, their reforestation efforts have helped recreate the lost habitats of the park. Even though these parks in Indonesia are under protection, many of their primary forests have been degraded significantly. Illegal logging and mining, as well as deforestation for agricultural purposes, continue to threaten these national parks. As a result, the wildlife living in the parks may face habitat loss if the forests are not conserved and protected.